PUNTERS are spoiled for choice in a week which includes some stellar horseracing action on Saturday and the kickoff of both the baseball World Series and the 2016/2017 NBA Championship. 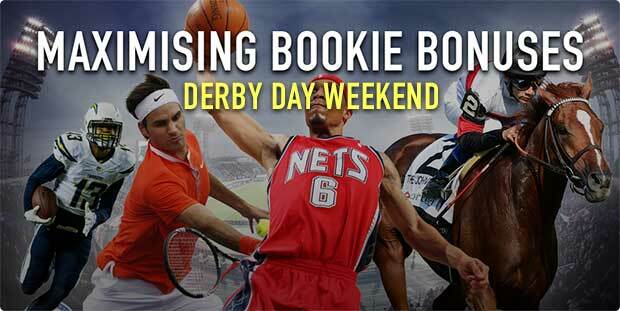 It’s Victoria Derby day on Saturday, which is widely considered as the best betting day of the year. Not only do punters have the Derby to bet on, but with races such as the Lexus Stakes, Myer Classic and who could forget the Group 1 Coolmore Stud Classic which features star three-year-olds Astern, Star Turn and Extreme Choice. This week is a dream for punters of all kinds, in particular those that love betting on the American sports. The NBA tips off this week and punters have already been keen to back the Golden State Warriors which were beaten finalists last season. The October Classic also starts this week when the Cleveland Indians take on the Chicago Cubs in a best-of-seven series which decides the best team in baseball. The bookmakers understand the importance of giving punters the best value and they have released some great bonuses for the week’s action. Where do I get bonuses this week? Sportsbet.com.au is one of the leading bookmakers in Australia and it has offered punters a wide array of bonuses this week. Sign up to Sportsbet and you not only get a bonus bet of 100% up to $501, but you also get to enjoy the many bonus bet offers available this week. Start the week off right by betting on the NBA which tips off on Wednesday. Sportsbet customers will be able to take advantage of all ESPN games shown this week and it favours the exotic bet players. Take a first basket scorer bet and if your player doesn’t score first, but scores the second or third basket, Sportsbet will give you up to $50 back in bonus bets. Continuing with its great NBA bonuses, Sportsbet also offers a deal for multi-bet punters. If your five-leg NBA multi-bet fails by one leg, don’t worry, Sportsbet will give you up to $50 back in bonus bets. Losing a multi-bet by one leg is frustating for punters, but the worry is now gone if you sign up to Sportsbet.com.au. The American sport bonuses continue when two of America’s favourite NFL teams do on Monday morning. The Philadelphia Eagles travel to Dallas to take on the Dallas Cowboys and if your Big Win, Little Win bet wins, Sportsbet will double your winnings up to $50 in bonus bets. Be sure to take your winnings from the week and have a bet on Derby day at Flemington this Saturday. Sportsbet will make sure you start your day off right by offering up to $50 in bonus bets if your horse finishes second or third in the opening four races on Derby day. CrownBet will give new punters 150% up to $450 in bonus bets which results in plenty of cash to splash this week on the various sport and horse racing events. CrownBet is popular among horse racing punters as it offers a live streaming service of all Victorian races and that includes the Derby day meeting this Saturday at Flemington where CrownBet has a bonus bet offer for. If your horse runs second or third in the first five races at Flemington this Saturday, it will give you up to $50 back in bonus bets, but that’s not the only racing special on the card at CrownBet this week. Punters can also enjoy a matched bonus bet offer at Pakenham on Thursday and another match bonus bet offer on the Thursday greyhounds at Dapto and Sandown. WilliamHill.com.au is following the theme of the other top bookmakers by offering a bonus bet on the first four races on Derby day. If your horse doesn’t win but finishes second or third in race 1-4, William Hill will equal your stake (up to $50) in bonus bets. New punters at William Hill can secure some bonus cash by signing up this week. William Hill will give 100% up to $502 in bonus bets which gives new punters plenty of money to bet with this week. WilliamHill.com.au is one of the leading bookmakers in the world and it takes American sport very seriously. There are three specials this week, covering MLB, NFL and NBA. Back a team to win a game in the World Series and if the game goes into extra innings and your team loses, it will refund your stake up to $50. Take an NFL bet this week and if your team scores four or more touchdowns during the game, William Hill will match your winnings in bonus bets. Its final offer will please NBA punters across Australia. Getting the best head-to-head line is important for any sports punter and William Hill is offering $1.95 lines for every NBA game this season. That’s incredible value and it’s much better than the $1.90 and $1.91 being offered with other bookmakers. How should I spend my bonuses? Punters should take advantage of the Derby day specials on offer this week. Our bookmakers make finishing second or third much less painful by offering up to $50 in bonus bets on the first four races at Flemington this Saturday. We want punters to start their day off on the right note this Saturday, so use your sign up bonus money on the following horses at Flemington which will all have a winning chance. The Carbine Club is the first race on the card and we fancy the John O’Shea-trained Morton’s Fork, which didn’t have much luck last start. The Godolphin colt looks a potential top-liner and it should be tough to beat in the opening race. Race 2 on the card is the Group 2 Wakeful Stakes, which includes Ethereal Stakes placegetter Tiamo Grace, which flashed home for second at Caulfield last start. The Darren Weir-trained filly will attract plenty of attention on race day, so now is the best time to back the promising three-year-old and if it happens to run second or third, you will get your stake matched at CrownBet.com.au. CrownBet is the only bookmaker offering a bonus bet offer for Group 1 Coolmore Stud Stakes this Saturday which has been described as the race of the carnival. The $500,000 race includes Golden Slipper winner Capitalist, Moir Stakes-winner Extreme Choice and Golden Rose-winning colt Astern. The field is the best on show during the Spring Carnival and we think Extreme Choice is the next big thing for trainer Mick Price. We can’t see it finishing worse than third, so place your bet with CrownBet for the added bonus bet insurance. The NBA is back in action and the $1.95 lines at William Hill is a great gift. There is one game that punters will be targetting this week, and although we can’t capitalise on the great head-to-head betting lines, there is a great points spread bet on offer. This Friday the Oklahoma City Thunder roll into Oakland to take on the Golden State Warriors and only one team is being respected in the market. The Thunder is currently +11.5 ($1.91 at Sportsbet) and considering the Thunder has current MVP favourite Russell Westbrook ($4 at Sportsbet) in the team, we think 11.5 points is generous. Include this option in your NBA multi-bets this week for added value. Back on home soil, fans of the A-League will be excited about the price for Perth Glory in the big Sunday night game against the Brisbane Roar. The Glory won a thrilling game last week and the $3 on offer at CrownBet is a great price and if you place a four-leg multi-bet with CrownBet and one of your legs doesn’t win, it will match your stake with a bonus bet up to $50.